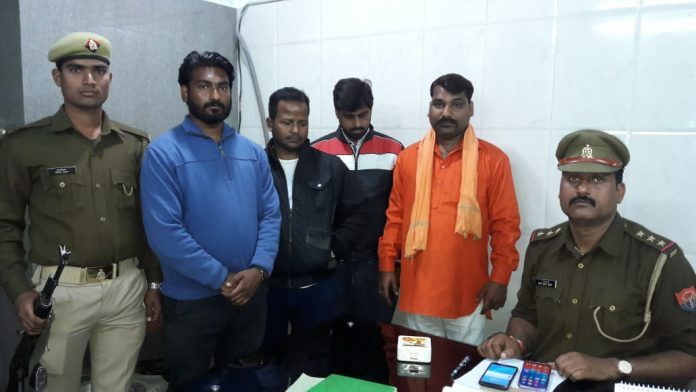 Lucknow, March 7 (IANS) All four accused of thrashing three Kashmiri dry fruit sellers here after calling them “stone-pelters” on Wednesday have been arrested, police said on Thursday. Briefing the media about “the unfortunate incident”, Director General of Police (Law & Order) Anand Kumar and Additional Director General of Police (Lucknow) Rajeev Krishna, said they had arrested the accused, who were identified as Bajrang Sonkar, Amar, Himanshu and Anirrudh. Sonkar, who was arrested earlier, is affiliated to the Vishwa Hindu Dal (VHD) and has a dozen criminal cases registered against him including one of murder, Senior Superintendent of Police Kalanidhi Naithani said. The attackers were initially booked under the Indian Penal Code, but non-bailable offences have also been included now, he added. The officials also said that the victims have been assured of security to carry out their business and have been provided medical care and compensation for the losses they incurred. The attack took place on Wednesday when a group of saffron-robed youths came out of a car and pounced on the Kashmiri men who were selling dry fruits on the Daliganj Bridge. The vendors were beaten up mercilessly, witnesses said, and their wares were thrown around. The attackers called the victims “stone-pelters” and asked them to produce their Aadhaar cards. The Kashmiris obliged but the attackers continued to beat them. No one came to the rescue of the victims. It was only after someone called the police that the Kashmiris were saved. Two of the injured vendors went away before police arrived there but a third, identified as Afzal, was taken to the local police station. Afzal was questioned for over an hour before an acquaintance vouched for him. No FIRs were registered against the attackers initially. It was only after a video of the incident went viral on the social media that police did so. Former Jammu and Kashmir Chief Minister Omar Abdullah condemned the brutality. “Nothing will do more damage to the idea of India in Jammu and Kashmir than videos like these,” he said in a series of tweets along with the video post. He called upon Union Home Minister Rajnath Singh, who is also the Lucknow MP, to punish “those guilty of this assault”.